I have tried for awhile to recreate store-bought rotisserie flavor at home. My problem is that it's not moist enough and I go too plain or too funky on the flavor. Today I had my first success. Clean the chicken and rub inside and out with about ¾ cup of spice rub, or sprinkle with the seasonings of your choice. Open the can of beer and pour out roughly half of it. Just removing the pop top is adequate, but some believe that cutting the top of the can off with a can opener allows more moisture to penetrate the bird during cooking. Yes - I believe in cutting the top off! Add about ¼ cup of your spice rub to the liquid in the can. To make it easier to remove the can from the chicken after cooking, brush the outside of the can with cooking oil or bacon grease before inserting it in the bird. If using charcoal, arrange the coals on either edge of the grill with empty space in the center where the chicken will stand. If using a two-burner gas grill, turn off one burner and place the chicken there. I used a three burner gas grill and had the two side burners on low. My temp gauge said it was about 325. Position the chicken on the grill over indirect heat. If the heat source is to one side rather than both, turn the chicken every 30 minutes or so during cooking. If using charcoal, add additional briquettes as needed to maintain the heat at the desired level throughout the cooking period. The bird is done when it reaches 160° F internal temperature, which usually takes about 1 ½-2 hours over medium low heat. 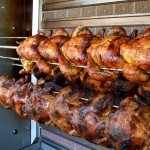 If desired, the chicken can be brushed periodically with a grilling or barbecue sauce during the last hour of cooking. I turned it and it took about 1 1/2 hrs for me. I didn't do any sauce rub this time. When done, carefully remove the bird from the grill. Use tongs to remove the beer can, and allow the bird to rest 15-20 minutes before carving. I used tongs and a meat fork to pry the can off and then popped it into a closed casserole to rest for 20 minutes. I added 1 tablespoon of Johnny's Seasoning Salt - a favorite of ours.